FREE Classroom Challenge | New Year Video Treasure Hunt for K-8! Find Your Favorite Second Step Characters and More! To ring in the New Year, Committee for Children—including our Second Step Program and Mind Yeti teams—celebrated the many educators who support social-emotional learning with our first ever 360º video. Now we want to share the fun with your students! 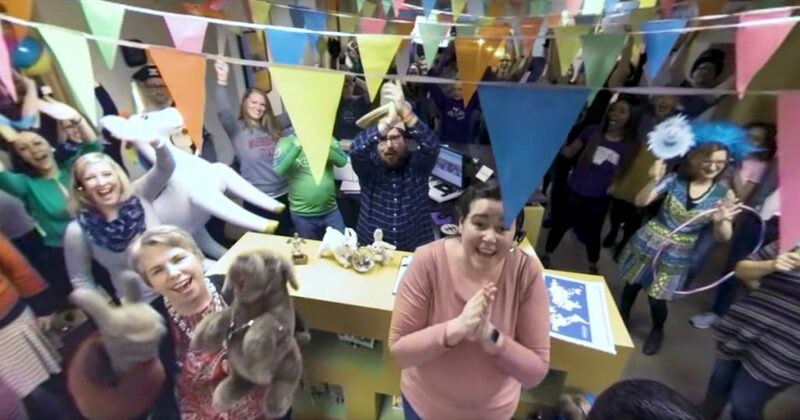 In this classroom challenge, set to the song “Can’t Stop the Feeling” from the movie Trolls, teachers will use the 360º video to take students on a treasure hunt. Either in groups or as individuals, students will look for their favorite Second Step characters, like Puppy and Snail, plus Second Step skills, Troll wigs, beach balls, and more! Read instructions, play the video, get the challenge key, and print out a tally sheet for your class! This is fun for all students EL–8! Teachers can determine which of the items from the list students should search for, as some may be more challenging than others. Tip: Teachers may want to watch the video beforehand to acclimate themselves to the 360º navigation. See below for viewing options. For best results, project the video from your classroom computer. Navigate the 360º video with your mouse or trackpad so you and your students can look up, down, and all around for the many fun things there are to find. Have students take out a pencil and paper, which they’ll use to tally the number of items they find. Provide students with the selection of items they’ll be searching for. Get the challenge key and tally sheet with visual cues! We’re adding more K–8 classroom activities to our Free Activities page all the time. They’re easy to find—just visit cfchildren.org/resources/free-classroom-activities for grade-specific, K–8 classroom activities that align with our Second Step Suite.